Clock Tower is the twenty-seventh level of Donkey Kong Jungle Beat and the second area of the Pear Kingdom. As its name implies, the level takes place in a clock tower with gears serving as obstacles. A new type of Helper Monkey is introduced here, and, unlike other Helper Monkeys, this type is suspended on a line instead of a bush, moving alongside Donkey Kong as he climbs the area. Two different kinds of Jungle Buddies appear in this level: Helibirds and Flurl. The two buddies can help Donkey Kong progress to the giant pear at the end of the level. If he bites into the fruit, he is taken to the battle against Gloat-Hog. The level begins in a dark room consisting of a few Pea Frogs. 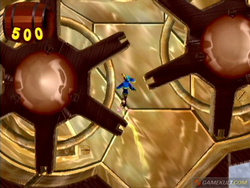 Large, yellow cogs are partially buried in the background here, and a Helper Monkey is at the end of the room on a rope. Another one of these monkeys is on a line above this, and some bananas are located around it. The two helpers can freely move along the ropes while throwing Donkey Kong around the area. A lone Helper Monkey on a bush is above the two monkeys on the ropes, and it has the ability to throw Donkey Kong to a set of two more Helper Monkeys on ropes. These two Helper Monkeys can throw Donkey Kong back and fourth as they move upwards to help him reach another Helper Monkey. This monkey throws him to some bananas and to another Helper Monkey on a rope. A platform is located below this Helper Monkey to catch Donkey Kong if he falls. The Helper Monkey on the rope can throw the Kong to a new room, where there is a Helibird. A few pink flowers producing wind are under the Helibird, and many cannonballs shoot from the Mini Elephant Cannons around the area. The Helibird can fly Donkey Kong to the highest point in the tall, yellow room, where there is a small gap leading to some more pink flowers and a lone Banana Bunch. The wind being produced by the flowers forces the Helibird to the ground, causing it to disappear. Many small fairies are flying around in this area, and if they are hit by a sound wave, they form a trampoline that can bounce the ape to some bananas and onto a conveyor belt. The belt is on the side of the wall, so the ape can grip onto it to move upwards. Another conveyor belt is on the other wall in the room, and jumping off of it takes the ape to Flurl. The squirrel buddy can help the ape parachute through a room full of cannonballs. An electrical chord is at the bottom of the area as well, but a ledge is near the end of the wire, so the squirrel can carry the Kong there. Bananas and Banana Bunches are on the way to this ledge, and some small fairies float at the corner of the room. The creatures can form a trampoline that can bounce Donkey Kong to three sets of Helper Monkeys, who are all on ropes. The monkeys can throw him to a slanted pathway. A purple flower grows here, and if it is hit by one of the ape's sound waves, it can push him up to a Helibird. This buddy can take the ape into a large room full a huge, brown cogs. The ape must maneuver the Helibird around the cogs well, or else it can hit into a cog and disappear. At the top-right part of the room, there is a small passage leading to some bananas and a smaller room. In the area, there is a Big Bee. Once this foe is defeated, the Helibird disappears, and a Helper Monkey appears in a nearby bush. The monkey can throw Donkey Kong through the gap in the ceiling, which is filled with many bananas. The gap makes a small U curve, and then leads into a new area, where there are many round platforms swaying back and fourth. There are giant spikes on each of them and they are covered with a few Kamikami. The platforms can be climbed to reach a group of three Helper Monkeys. The monkey in the center of the group can throw Donkey Kong upwards to some bananas and to a larger area. In this area, Donkey Kong runs into a Helibird, who can fly him around the obstacles in the large, round room. A large wall blocks the left side of the room, and a small gap is located near the entrance of it. The gap is occupied by two Banana Bunches and a Helibird, who can help the ape if he loses his other Helibird. A giant Banana Bunch is at the top part of the room. Once it is collected, the wall blocking the other end of the room begins to move, allowing Donkey Kong to progress. Another gap is on the left side of the area's perimeter, and it is filled with some more Banana Bunches and another Helibird. A third gap is a the higher parts of the room, and, as the two small gaps before, it has some Banana Bunches and a Helibird. At the top center of the area, there is a narrow passage leading upwards to another room. In this room, a giant, sparkling pear can be found growing on a tree branch. Some Banana Bunches are also located at the top-left corner of the room. If Donkey Kong bites into the pear in the area, the level ends. This page was last edited on April 12, 2019, at 13:26.